San Diego has been called “the birthplace of California”. It is historically the first place visited by Europeans on what is now the West Coast of the United States. This sunny, humid area is known for its zoos, museums, and natural reserves. Naturally, it’s also an area in which residents are looking for ways of maximizing their energy saving capabilities so they can get through the hot summer months without spending too much in cooling bills. Not only are our San Diego blinds, shades, and shutters great for reducing solar heat gain in your home when the year is at its hottest, they can also be used to conserve heat during the cool winter months. The right combination of window coverings can help you get the best out of both worlds. Vineyard Blind & Shutter provides a wide variety of beautiful, high quality window coverings at prices that are affordable. We provide window coverings in San Diego that will help you save energy year round. This kind of strategy can be highly cost effective and energy efficient. Shutters: Shutters were initially created in order to block both cold winds and hot sunlight. This dual function continues today when it comes to energy saving purposes. Investing in insulated interior shutters is one of the best ways of doing so. These shutters include rigid foam insulation, which gives them a unique ability to reduce solar heat gain throughout the summer. These shutters will also help reduce heat loss during the winter. 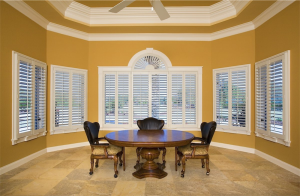 If used properly, our San Diego shutters will pay for themselves! Make sure to keep these shutters closed on the eastern and western windows during the morning and evening, respectively. This can help mitigate the loss of cool air. Make sure your shutters are installed as snugly against your windows as possible for maximum effect. Louvered shutters are also a great product for maximizing your energy saving potential, as they work similarly to blinds and are great for reducing solar heat gain. Blinds: San Diego blinds are great for minimizing heat gain during the summer by closing off light and heat from your home. When investing in energy saving blinds, make sure to purchase blinds comprised of highly reflective material, which is best for keeping light and heat out of your home. Remember: bright material reflects light and heat. On the other side of the coin, blinds comprised of dark materials absorb heat, and will increase the amount of heat entering your home – these are the best blinds to have installed during the winter to help absorb and trap heat. You can switch from one of these blinds to the other depending on the season to maximize your energy saving potential all year round. No matter what month it might be, always remember to keep your blinds installed as snugly as possible for maximum energy saving capacity. Shades: San Diego shades can be great resources for saving energy, especially when they are comprised of cellular shade fabric, resembling honeycomb. This helps maximize the insulation in your home, as well as guard against UV light from the sun, which can damage fabric, paintings, and furniture over time. Investing in dual shade window coverings, which include both a reflective and absorbent side, are an efficient and dynamic way of maximizing your energy saving potential year round. One of the best ways of reducing solar heat gain is through Basic Roman Shades. 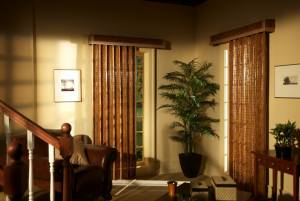 Insulated Roman Shades are also great for helping you retain heat in your home during the winter. Depending on the season, you can rotate through these shades depending on the respective season to get the most out of your San Diego shades. We are dedicated to providing our customers with high quality window coverings at prices that are affordable. With Vineyard Blind & Shutter, lower prices does not mean an inferior product. Our window coverings are beautiful, durable, and easy to use. One of the reasons our customers find our services so convenient is that we provide mobile San Diego window covering services. This means we bring our showroom directly to your address. Whether it’s at your house or business, we can bring our products to you so that you can view them in the very place you plan to install them, before deciding on your purchase. What better way to make sure you are buying the perfect product than to view it in the natural lighting of your own home? With Vineyard Blind & Shutter, you won’t have to worry about inadvertently making a sub par purchase. We are so confident in our products that we are happy to bring them directly to you so you can see and feel them yourself. When it comes to home decor, there are few things as frustrating as making a selection or placing an order, only to later find out that it doesn’t look right, or fit correctly. With us, your selection is guaranteed to meet all of the required measurements and achieve the aesthetic appeal you had originally anticipated. 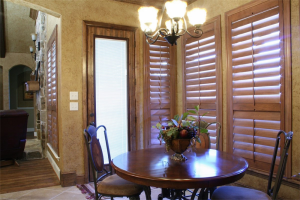 For high quality shades, shutters, and blinds in San Diego at affordable prices, contact us today!